When parallel modules in a digital task are in slots 1 through 4, FIFO is 2,047 samples per slot for all slots. When any parallel module in a digital task is in slots 5 through 8, FIFO is 1,023 samples per slot for all eight slots. The protection provided by the cDAQ-9189 chassis can be impaired if it is used in a manner not described in the cDAQ-9185/9189 User Manual. Sleep mode for C Series modules is not supported in the cDAQ-9189. When operating the cDAQ-9189 in hazardous locations, you must use the power connector with an external power supply rated for hazardous locations. The power supply included in the cDAQ-9189 kit is intended only for desktop use. For all other applications use the included 2-position power connector plug and a power supply rated for your application power requirements. Visit ni.com to find hazardous locations-certified power supplies. 272.8 mm × 88.1 mm × 62.3 mm (10.74 in. × 3.47 in. × 2.45 in.) Refer to the following figure. Failure to follow the mounting instructions in the cDAQ-9185/9189 User Manual can cause temperature derating. To meet these specifications, you must direct mount the cDAQ-9189 system and affix ferrules to the ends of the terminal lines. 3 Base clocks can be synchronized with other chassis using the network synchronization feature. 4 Actual available signals are dependent on type of installed C Series module. 5 Stresses beyond those listed under Maximum operating conditions may cause permanent damage to the chassis. 6 When a session is active, CAN or LIN (NI-XNET) C Series modules use a total of two data streams regardless of the number of NI-XNET modules in the chassis. 7 This allows for line topologies or network redundancy. 8 With default software configuration. For information about creating reliable Ethernet-based systems, visit ni.com/info and enter Info Code cdaqenet. 9 I/O synchronization is system-dependent. 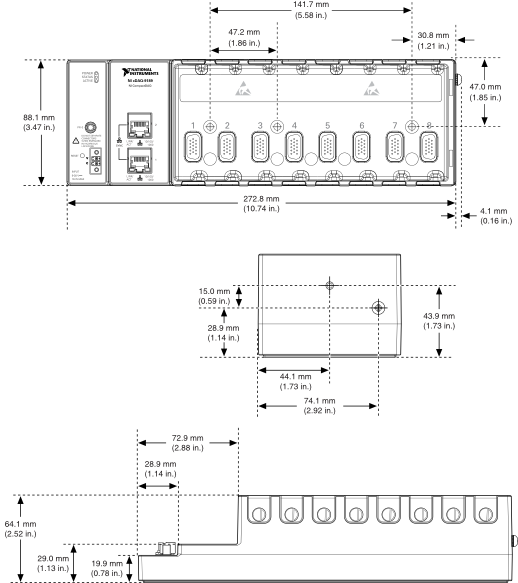 Assumes the chassis are connected in a line topology with a typical selection of C Series modules containing a variety of timing architectures. For information about network synchronization accuracy, visit ni.com/info and enter Info Code syncacc. 10 I/O synchronization is system-dependent. Assumes a system containing one hop with optimized C Series module selection. For information about achieving high accuracy synchronization, visit ni.com/info and enter Info Code cdaqsync. 11 Includes maximum 1 W module load per slot across rated temperature and product variations. 12 When operating the cDAQ-9189 in temperatures below 0 °C, you must use the PS-15 power supply or another power supply rated for below 0 °C. 13 Use NI 9917 and NI 9918 industrial enclosures to protect the device in harsh, dirty, or wet environments.